BALTIMORE (AP) - Universities in Maryland are now grappling with racist images in yearbooks from the 1960s and 1970s. Yearbook pages from another fraternity in the 1960s include references to minstrel shows as well as photos of men in blackface. A 1965 yearbook photo shows a man in black paint at a football celebration. The Johns Hopkins University also unearthed racist photos. They include a student in blackface in 1981 and people in robes and hoods in 1961. The images are re-emerging in the wake of the scandal plaguing Virginia . A racist photo surfaced last week from Gov. 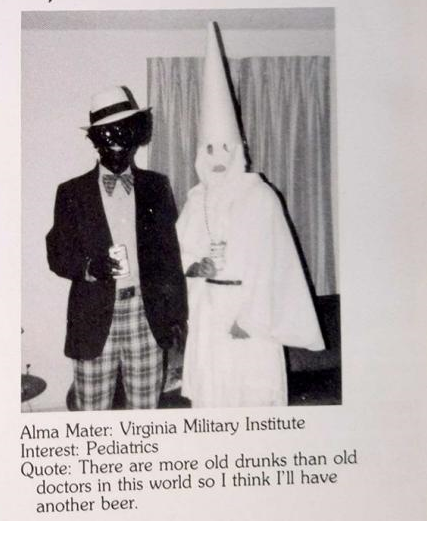 Ralph Northam's medical school yearbook page. He has denied being in the photo.